After a scary crash in the final leg in the Rio Olympics, Dutch cyclist van Vleuten is reported by team officials to have suffered three spinal fractures and a concussion, according to the Washington Post. While football has received a lot of media coverage for concussions, its actually cycling that has the most sports-related tramautic brain injury (TBI). The Rio Olympian's injury is a terrible reminder that even the most experienced cyclists can have accidents that result in TBI. Read on to learn more about concussions and how new types of brain imaging are important in evaluating patients whose concussion symptoms persist. What is a concussion? Concussions are a type of mild traumatic brain injury, with short-term impairment of neurologic function. There are many symptoms associated with concussions, including headaches, dizziness, difficulty concentrating, confusion and sensitivity to light. Most symptoms go away within 7-10 days. However for some patients, symptoms persist for weeks, months or even years. What happens after an athlete is injured in a sporting event? The management of head injuries during sporting events has significantly changed in the last couple of decades. Following suspected concussion, an athlete should be removed from play and assessed by a licensed health care professional who is experienced in administering a sideline assessment. Once a concussion is diagnosed, return to play needs to be gradual. Research has shown that if a second injury occurs before the brain has recovered, damage can be significantly worsened. What kind of brain imaging should be performed after a concussion? Brain imaging, such as a CT scan, should not be used to diagnose a sports related concussion, and the majority of concussed athletes will not require any brain imaging. However if there are signs and symptoms that suggest a more serious injury, such as an intracranial bleed, a CT scan is the test of choice in the first 24-48 hours. Some of these more serious symptoms include seizures, nausea/vomiting, drowsiness, severe headaches and prolonged loss of consciousness. After 48 hours, however, MRI is the preferred brain imaging technique, as MRI is more sensitive than CT in detecting small intracranial bleeds and brain bruises. Another advantage of MRI over CT is the lack of x-ray radiation. MRI may be helpful in evaluating those patients with prolonged symptoms, or postconcussion syndrome. While standard MRI studies are often negative following concussion, advanced MRI techniques that are being investigated may improve diagnosis of brain injury. Susceptibility MRI is a new technique that improves visibility of small brain hemorrhages (see figure 1 below). Diffusion tensor MRI, or DTI, can be used to see the white matter tracts in the brain that can be injured with head trauma (see figures 2 & 3 below). Functional MRI, or fMRI, has been used to look at abnormal brain activity following head injury. However, more research is necessary to determine the role of DTI and fMRI in concussion. In summary, CT and MRI are not used to diagnose a concussion, however are helpful if there are signs of a more serious injury. 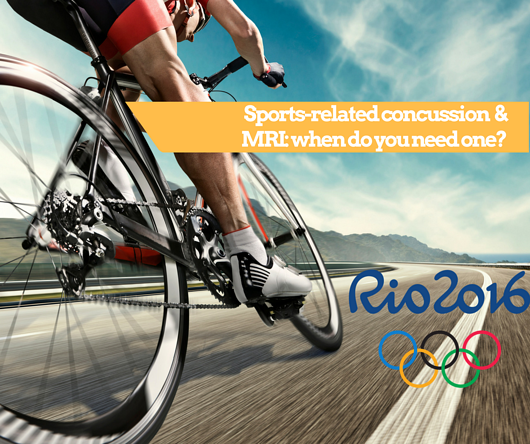 After 48 hours, MRI is the preferred technique and can also be helpful in the setting of post-concussion syndrome. Figure 1. 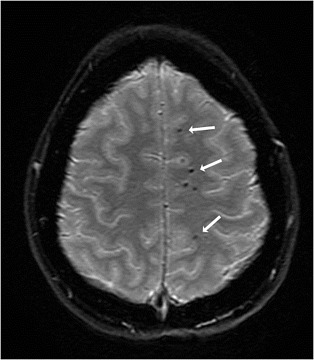 Susceptibility MRI image in a patient with head injury shows small hemorrhages within the brain, that may otherwise have gone undetected. Figure 2. 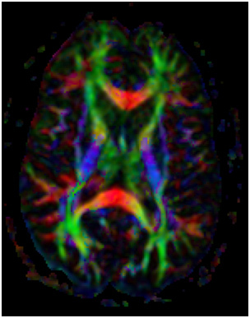 Diffusion tensor MRI image demonstrates the white matter tracts in the brain, color coded according to direction. Figure 3. 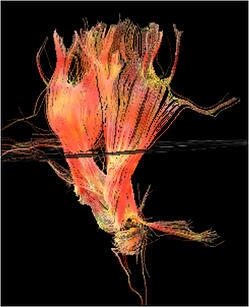 Diffusion tensor MRI can also show the white matter tracts in 3-D.
1. McCrory P, et al. Concussion statement on concussion in sport: the 4th International Conference on Concussion in Sport held in Zurich, November 2012, Br J Sports Med 2013;47:250-258. 2. Giza C, Kutcher J, Ashwal S, et al. Summary of evidence-based guideline update: Evaluation and management of concussion in sports: Report of the Guideline Development Subcommitee of the Amercian Academy of Neurology. Neurology 2013. 3. Harmon K, et al. American Medical Society for Sports Medicine position statement: concussion in sport. Br J Sports Med 2013;47:15-26. 4. Halstead, M, Walter, K.Clinical Report - Sport-Related Concussion in Children and Adolescents. Pediatrics. 2010;126(3): 597-615. 5. Meehan WP, d'Hemecourt P, Collins C, Comstock RD, Assessment and Management of Sport-Related Concussions in United States High Schools. Am. J. Sports Med. 2011;20(10).